"She now has become entrenched among the ranks of America's leading composers. ... For Schneider, the question is no longer whether she can sustain the heights she has attained on earlier recordings; it is now how far her musical journey will take her." "Maria Schneider tells stories in music as well as great novelists tell them in words. On her new album, Sky Blue, she puts together stories that speak with the clarity of Ernest Hemingway and the musical grace of Aaron Copland. It is touching without ever lapsing into tawdry sentiment. Accomplishing that in emotion is a feat. Doing it in music is a masterpiece. As is this album." 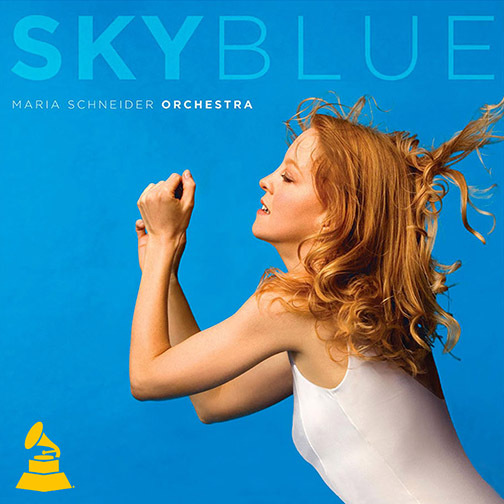 "It seemed impossible for Schneider top her Grammy-winning Concert in the Garden, but she's done just that with Sky Blue. She has elevated her music to a seemingly impossible height. ... 'Cerulean Skies' is the masterpiece within a masterpiece, ... Magnificent. A magical work of art, from beginning to end." "Blue, as in "Sky Blue" and "Cerulean Skies," reflects the young colorist's Picasso-like "blue period." Like the symbolic overtones associated with the color itself, Schneider's luminous, azure odes are imbued with mystery and serenity, beauty and truth." "What she does, across the five elegant tracks of Sky Blue, is to create new strands of melody – finely crafted yet tough as steel cable – set within orchestrations that are richly detailed and unhurried, lush but never schmaltzy." "Plan on wearing out this album [Sky Blue], because you will want to keep listening for deeper insights. All those little digits will eventually get their edges worn off from being played so often." "Sky Blue is an album of remarkable depth and beauty—an expansive, imagery laden experience, from an artist who’s ready to be considered in the same breath as those who’ve been so important to her own development." "The disc [Sky Blue] is by far her most ambitious. It is also much more than your father's big band jazz dressed up with classical flourishes. It is integrated, orchestral, composed with specific musicians in mind and among the most arresting, accomplished music of the new century."